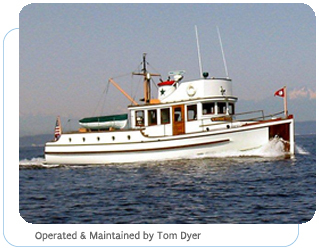 "Expert Tom Dyer, a naval architect and marine engineer, inspected the [vessel] and conducted an underway evaluation... Filling the void is Mr. Dyer's testimony, which the Court finds both credible and persuasive." - R.S. LASNICK, U.S. DISTRICT COURT JUDGE, Memorandum of Decision No. C03-1161L, U.S. District Court, Western District of Washington. "We were very impressed with how you related to the jury and were able to deliver such complicated information in a simple and understandable way...your low key profile and personable and warm delivery was received very well...there was not one juror with a negative remark about your presentation." "Your careful analysis, evenhanded testimony, and obvious professionalism were recognized and much appreciated at trial and throughout the litigation. It was a privilege to work with you." "Thanks...for your help...especially for being available with a quick response and ready insight." "I thought you did an excellent job as a witness the other day. You were straight forward and knowledgeable." "You handled the aggressive cross examination very well"
Serving the Pacific Northwest, California, and Alaska from Seattle & San Francisco. ©2006 - 2019 Headway Marine LLC. All Rights Reserved.